On Friday, July 26, Bike & Walk Morristown’s biggest celebration hits South Street, along with some other streets. Our Saris Bike Corral Ribbon cutting is at 6:00 at Kings on South Street. This bike corral is Morristown’s first, and was won after many many Morristown residents and businesses spent days and weeks annoying people 24/7 on facebook to vote in a contest, and through their dedication, we WON. Please come out for this ceremony and celebrate bikes and people in Morristown who worked so hard to make sure Kings has an awesome place to put your bike. At 6:30, the regular Critical Mass ride takes off from Morristown Town Hall parking lot, which is right across the street from Kings, at 200 South Street. Then at 7:00 pm, our Music.Picnic.Art event takes over the lawn at the Vail Mansion. Music: The Lords of Liechtenstein will be providing the soundtrack to the picnic all night long. 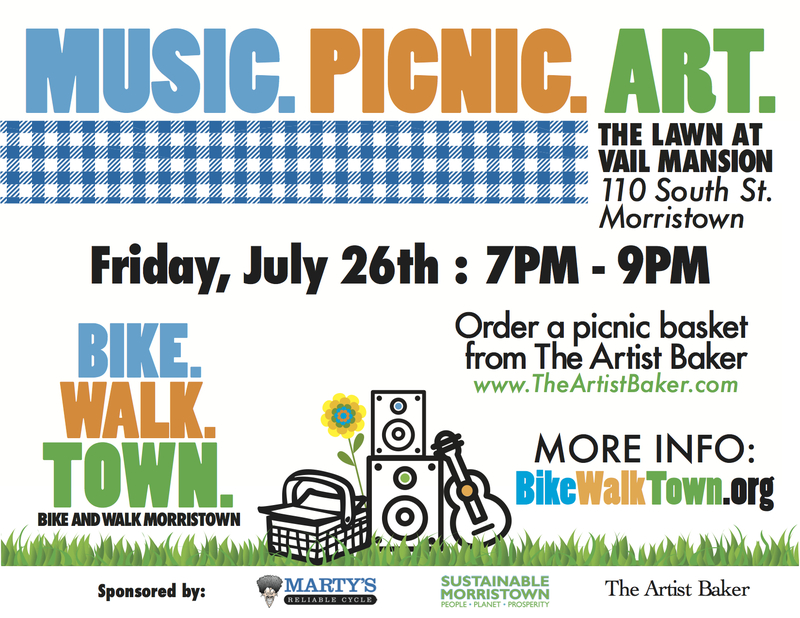 Picnic: Picnic baskets ordered from the Artist Baker will be delivered to the lawn at the Vail Mansion, and besides being delicious, every dinner ordered helps to support Bike and Walk Morristown. If you miss the cutoff date or just prefer a burrito or something else, please bring your own picnic and be ready to dine outside with a million of your new closest friends. Art: Local artist will be displaying their creations and have them up for sale, so bring some extra cash, so you’ll be ready if something strikes your fancy. Yoga Morristown will be helping us out with a post-ride pre-dinner stretch, and there is the possibility of hoops and other good stuff.